Medical Gas Equipment Market size was valued at USD 4.3 billion in 2017 and is expected to witness more than 7.6% CAGR from 2018 to 2024. Growing geriatric population base is one of the major factors responsible for the growth of medical gas equipment market growth. Increasing average life expectancy, growing healthcare infrastructure and decreasing fertility are few of the major reasons responsible for the growth of geriatric population. As per the estimates of United Nations (UN), the geriatric population is expected to reach 2.1 billion by the year 2050. This product meets specific needs of the patient and is more user friendly. As number of in-patients will increase, the demand for medical gases such as oxygen supply will increase, thereby driving the market growth. Rising prevalence of pulmonary diseases will boost market growth during the foreseeable future. Adoption of sedentary lifestyle along with unhealthy diet and smoking are the major causes of growing incidences of chronic obstructive pulmonary disease. Increasing prevalence of respiratory diseases coupled with growing public awareness levels for early diagnosis and prevention will drive demand of the market. This will increase the demand for respiratory devices in point of care diagnostics and home healthcare, that will positively drive the market worth. Vacuum systems market was valued at USD 1,337.3 million in 2017 owing to increasing need of medical air in healthcare settings. High growth rate is attributable to various technological advancements for developing cutting-edge vacuum systems. Decreased noise level system and efficient cleaning system offers low maintenance, thereby enabling installation of vacuum systems at point of use and saving cost. Various ongoing introduction of novel vacuum system designs and continuous technological improvements will augment the business growth in the upcoming future. Manifolds market will expand at 7.7% CAGR during the forecast timeframe owing to various technological advances and growing demand for medical air. With wide array of applications in different healthcare settings such as hospitals and ambulatory surgical centers, manifold systems will witness significant growth in the future. Moreover, various technological advancements aimed for optimizing medical gas supply in hospitals will significantly increase demand for manifold systems in the future. Such factors will favour segmental growth in recent years. Medical gas equipment hospitals business accounted for largest revenue of USD 1,660.2 million in 2017. Market growth is attributable to rising number respiratory disease cases across the globe. Favourable insurance policies in developed countries for respiratory treatments will favor segmental growth. Moreover, government policies for safe and effective supply of medical gases will attract large number of patients in hospitals to seek treatments, thus favoring segmental growth in the future. Ambulatory surgical centres market will grow at a remarkable rate of 8.0% throughout the projected timeframe. The segmental growth is attributable to growing demand of cost-effective treatments for various pulmonary disorders. Ability of ambulatory surgical centres to reduce healthcare-associated costs by offering single day treatment solutions will positively influence market growth in the upcoming period. U.S. market contributed to largest revenue of USD 1,472.6 million in North America in 2017. High disposable income and various government policies such as implementation of U.S. FDA Safety and Innovation Act will foster business growth. Growing burden of chronic obstructive pulmonary disease and emergency asthma cases will aid in growth of medical gas equipment business. Moreover, various insurance and reimbursement policies by Center for Medicare and Medicaid Services will foster regional growth in foreseeable years. 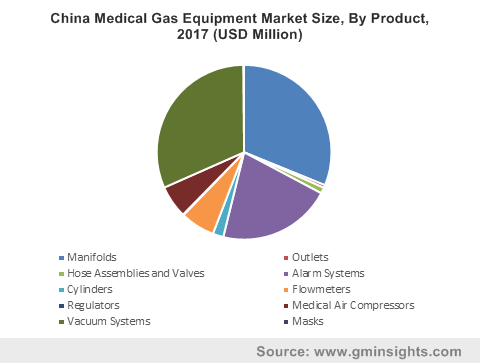 China medical gas equipment market is forecasted to expand at a CAGR of 9.9% across the forecast timeframe. High growth rate is attributable to growing incidences of pulmonary diseases and expanding geriatric population base. Furthermore, rising number of emergency medical cases involving use of medical gases will fuel industry growth. Increasing healthcare expenditure, growing per-capita income and favorable government policies will boost industry growth. 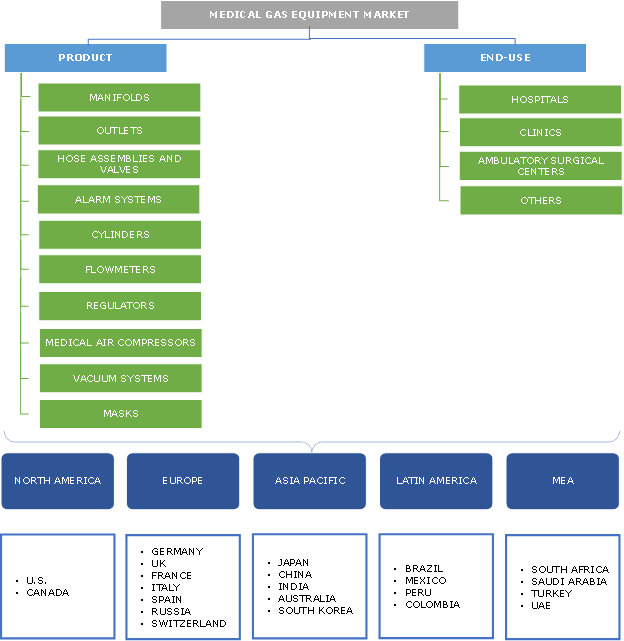 Few of the notable industry players operating in global medical gas equipment market are Air Liquide, Allied Healthcare Products Inc., Amico Corp., BeaconMedæs, Gentec Corp., Linde Gas, Matheson Tri-Gas Inc., Ohio Medical, Powerex and Praxair Inc. These companies are opting strategies such as novel product launch, mergers and acquisitions to foster business in medical gas equipment industry. Medical gas have been used for various applications since mid-1850’s. Numerous upgradations for optimal transport and supply of these essential gas have been done since its initial use. 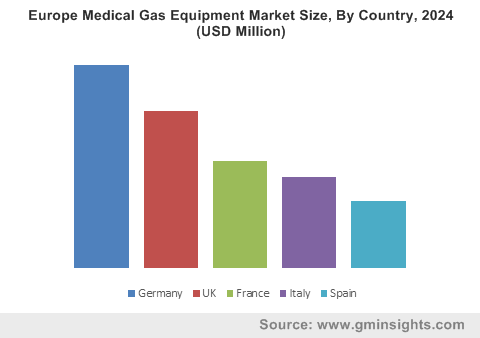 Medical gas equipment market will witness significant growth in developed countries owing to various regulations and policies for safe and efficient delivery of medical gas. 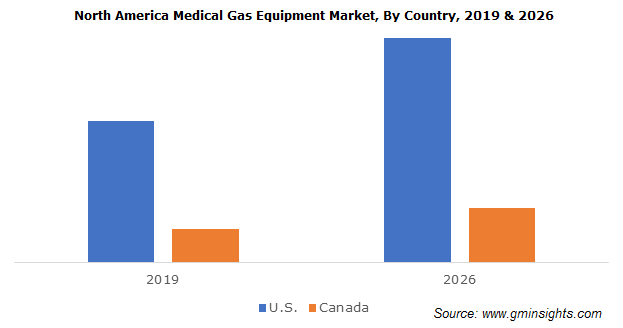 Medical gas equipment market is expected to show rapid growth in developing countries on account of exploration of new growth opportunities in developing countries. Demographic changes and adoption of unhealthy lifestyle will result in high incidences of chronic obstructive pulmonary diseases across the globe. Market is witnessing influx of new entrants that are engaged in the development of advanced medical gas equipment to generate higher revenue. With advancements in existing technologies, medical gas equipment industry will offer promising growth opportunities in near future.